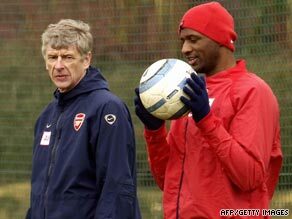 Arsenal manager Arsene Wenger has refused to rule out a sensational swoop for the English Premier League club’s former midfield general Patrick Vieira. The veteran France international is expected to leave Italian champions Inter Milan, and has been linked with a return to Arsenal following rumors that he is also wanted by north London rivals Tottenham. Wenger has been at pains to insist that he does not need to strengthen his squad, despite the departure of striker Emmanuel Adebayor and defender Kolo Toure to Manchester City. But the Frenchman has admitted that the 33-year-old Vieira is keen to come back to the club he left for Juventus in 2005 after nine trophy-laden years. “He has gone through a difficult period in the last season and I am aware that he wants to come here,” Wenger told reporters. “I think Patrick is a legend here and he would always like to come back to this club. That would be his first choice. “He is a professional footballer with emotion and you always like the club where you’ve spent time.